Previously, on MinerBumping... As I peacefully instructed caveywavey on the consequences of illegal mining, the Vattuolen system residents began to voice their dissent. Out of nowhere, my Invincible Stabber's propulsion cut out. I was under attack! 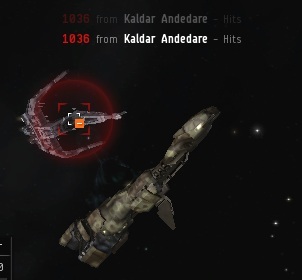 Kaldar Andedare, who had been following me around and giving me the "carebear stare" in his Caracal, fired upon me, the rightful ruler of highsec. Treason! 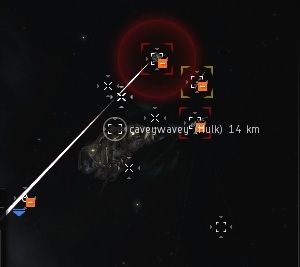 This was no ordinary ganking Caracal. It was equipped with tech II heavy assault missiles, a weapon designed to be a high-DPS option for missile users. Even more diabolical, it was firing Mjolnir missiles, deliberately exploiting the EM resistance hole in my shields, which peeled away at an alarming rate. The missiles kept coming, with no Concord in sight. Was this the end of the Invincible Stabber, the flagship of the New Order? No, not really. Concord arrived and the Caracal popped. But then, just as the dust was settling, more assassins dropped into view. 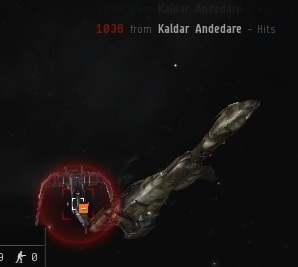 Kaldar's EM missiles had only been the first wave, weakening my shields in preparation for the real attack. It was a trap! I immediately recognized the rebels. A few months earlier, they had organized a terrorist attack against me involving three Catalysts and a Brutix. The attack failed because the Brutix pilot, along with the mouthy Catalyst pilot Billy Love, had lost their nerve at the last moment and didn't pull the trigger. Last time, they had been scolded for their lack of resolve. They were determined not to repeat the mistake. But the Invincible Stabber is nothing to be trifled with. wekko2's Catalyst was the first to go down. Eager to get myself in a good position to loot their inevitable wrecks, I swooped around toward my enemies. 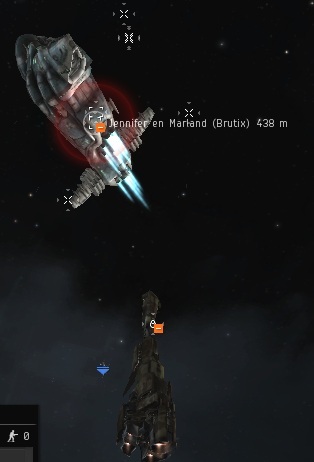 Jennifer en Marland, the Brutix pilot, was penalized with a good bump for her troubles. As I rifled through the wrecks and examined the rebels' involuntary donations to the New Order, I received more combat notifications. Frozen Corpse James315 showed up in his Griffin and pelted me with a few rockets, hoping to get his name on the killmail that his fellow rebels had promised. 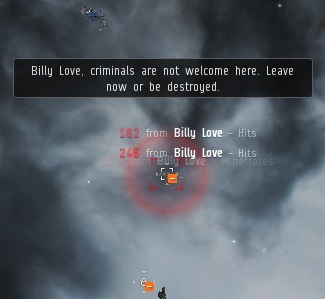 Billy Love, tardy as always, was the last to open fire. By the time he activated the weapons on his Catalyst, the battle was long over, and my shields were regenerating faster than he could drop them. I surveyed the rebel graveyard, a monument to the senseless violence they had committed against me. In plotting their elaborate attack, they had carefully calculated all of the EHP and DPS statistics. But they had neglected the most important factor of all: They were fueled by hatred and ignorance. The New Order is powered by love. They were destined to lose. The Battle of Vattuolen was won. It was a devastating defeat for rebel forces. 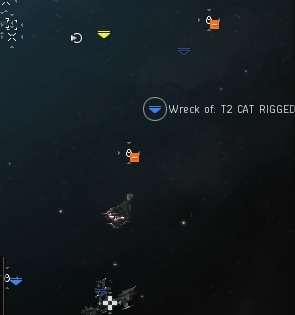 They lost over 100 million isk of ships and equipment. 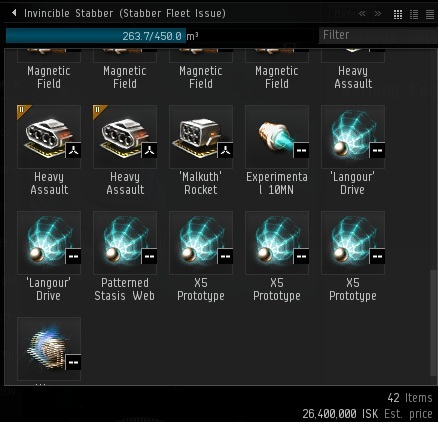 I gathered 26 million isk worth of the infernal devices and vowed to put them to good use. Among the confiscated weapons were no less than six webifiers. You can web an Agent of the New Order, but you can never slow down our cause. For it is just. 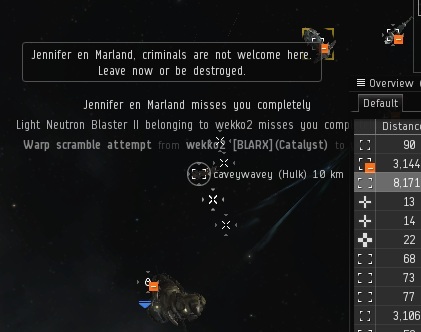 Always a good sport, I applauded the doomed criminals for at least not abandoning their fellow gankers mid-battle this time. The locals were disappointed to hear of the morale-shattering outcome. Disappointment is the only fruit that the poisonous anti-Order rebellion is capable of bringing forth. Trusting in the Invincible Stabber is by far the better option! ANOTHER GLORIOUS VICTORY FOR THE NEW ORDER!!! Once again, our Supreme Protector prevails over a half-dozen elite rebel assassins, without even firing a shot. For the Code is his shield and CONCORD is his sword! 'Elite' in a relative sense. If CONCORD is his (reffering to James 315) sword, how come you agents are BLUDGEONED with it more often than the rebels??? I assume you are referring to the ceremonial evaporation of our Catalysts. See James 315s sword performs not only acts of defense in the name of the New Order, but also ceremonial acts that you refer too. Each Catalyst is sent to a better place once deemed worthy by its acts. We appreciate your desire for knowledge. There is a wealth of it here on these very pages, read on. You call it knowledge, but I have a different term for it...mine term is more accurate!!! Anon, please share with us the term you use for what it is you desire? My term is ham, I desire ham. I like that the 2nd wave attacked James with CONCORD only 22km away! I just can't understand why they decided to try and gank him in waves instead of all striking in the same moment. As misguided as they were, I toast their resolve! This is a big accomplishment in moving from the carebear stare to actually pulling the trigger. There is hope yet. Long live James 315 and The New Order !!! Saints be praised! Our savior lives! Our Lady of the Belts was watching over you truly. Notice that like all expert villains, she got away clean........James didn't get any kill rights on her.....devious, that one is. 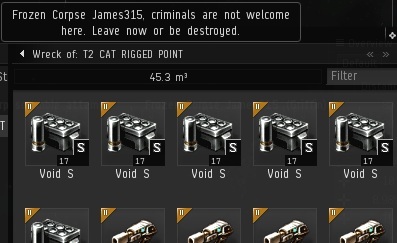 I actually find these posts quite entertaining while mining illegaly. "They were fueled by hatred and ignorance. The New Order is powered by love. They were destined to lose." I've been watching the NO and the Rebels from the sidelines over the past year and this rings very true from what I've seen. Some of the hate and vitriol those rebels spew out is truly shocking. Orcas have been taken down with less, truly the Invincible Stabber isn't just a name but a description too. Perhaps they'll start to realise that teamwork isn't for everyone. Communication is a skill you must want to develop and practice listening and defer your actions to another' will. All they had to do is press pre-target and activate modules at the same time, perhaps they weren't on voice comms together? 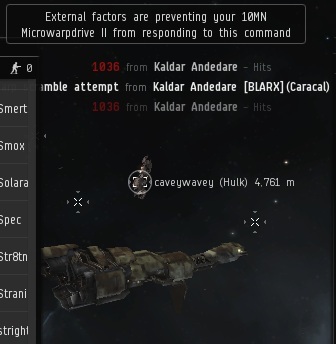 Although I doubt that they will have the courage to admit it publicly, I'm sure the regular New Order critics, so noticeable by their silence at this moment of their utter defeat, can now see that a true heart, stern resolve and a deep and abiding love for your fellow Eve player are what makes the New Order so successful. How can the carebears ever hope to win? More than one year of New Order ganks, with a website explaining in detail how to suiced gank, and yet the carebears fail to execute their attack in incredibly stupid ways. Maybe James 315 is right about them. Whether this was success or fail depends on the objective(s) - Immediately after the attack James 315 docked and logged off. Peace and harmony returned to local.